This past summer, USDA’s Food and Nutrition Service (FNS) and Rural Development (RD) agencies continued their partnership to close the nutrition gap that children face during the summer months. 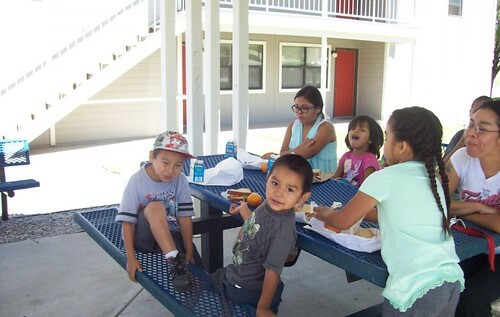 FNS Summer Meal Programs provide nutritious meals and snacks to low-income communities at no cost. So, RD provided space in their multi-family housing communities where kids could enjoy the food. Then, local sponsoring organizations provided the food and were reimbursed through the FNS Summer Meal Programs. The partnership was that simple! Gallup may be a humble city along historic Route 66, but the kids there have big dreams. USDA is thankful to communities like Cliffside Apartments who have joined USDA’s effort to keep kids’ dreams alive by nourishing them during the summer. Do you know of a community that could benefit from serving summer meals to their kids next year? Whether rural, urban or suburban, all they need is a safe location for kids to eat and a local sponsor to provide food. As demonstrated by FNS and RD, a little teamwork goes a long way! Learn how to bring summer meals to a community near you by visiting www.summerfood.usda.gov. The number of children within the United States whom go hungry on a daily basis is astonishing. That is why I believe this program is truly wonderful and necessary. I think that this partnership program between the Food and Nutrition Services and Rural Development agencies have made great strides in the USDA's mission to keep kids dreams alive by providing them proper nutrition. While summer break is the longest for students, there are also many other breaks throughout the year. Not only that, but there are many school districts around the country that participate in year round schooling, which gives students shorter yet more frequent breaks throughout the year. The point being there are various breaks throughout the year in which these children would not have access to food. I think it would be beneficial for this partnership to continue not just through the summer months, but year round. A year round program would greatly reduce the nutrition gap that the USDA and various agencies are working hard to reduce.